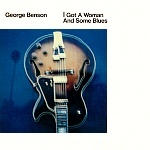 GEORGE BENSON "I GOT A WOMAN AND SOME BLUES"
George Benson (guitar, vocals) with unknown organ, bass, drums. George Benson (guitar) with unknown saxophone, organ, bass, drums. George Benson (guitar) with unknown saxophone, flute, organ, bass, drums, congas. George Benson (guitar, vocals) with unknown brass, piano, bass, drums. George Benson (guitar) with unknown brass, piano, bass, drums. George Benson (guitar) with others unknown.